Granting his request 'for everyone to become Lula' federal and state lawmakers are adding the name of the former President to their own legislative name. RIO DE JANEIRO, BRAZIL – Supporters of former president Luiz Inacio Lula da Silva are taking to heart one of the last requests made by the two-term president hours before he turned himself in to police to start his twelve-year jail term. In his last speech before surrendering he asked everyone ‘to become Lula” and lawmakers are doing just that, adding the name Lula to their own name. 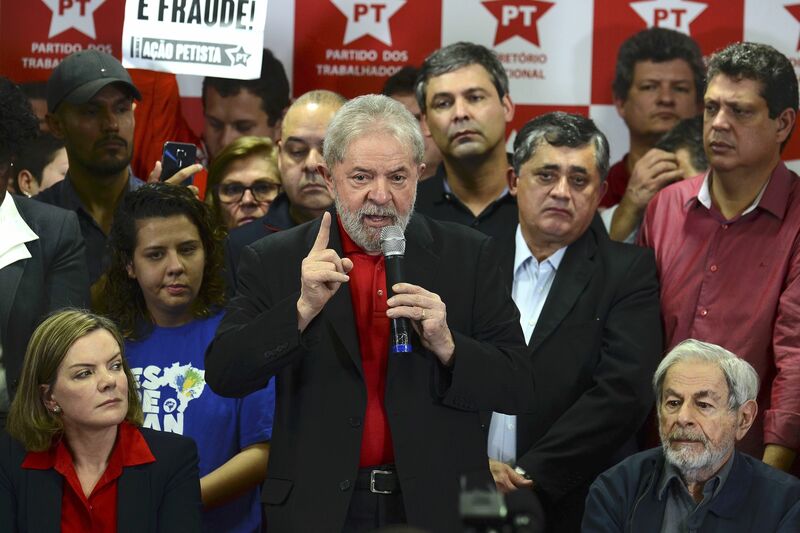 Former President, Luis Inacio Lula da Silva speaking to supporters late last year, photo by Rovena Rosa/Agência Brasil. “I ask to change my name in the roster of this House (Senate), including in the electronic voting board of the plenary, my lawmaker’s name from Gleisi Hoffman to Gleisi Lula Hoffman,” said the official letter sent by Senator Hoffman to Senate President, Eunicio Oliveira earlier this week. Hoffman is senator from the PT (Workers Party) as well as the party’s president. Other lawmakers, such as Senators Fatima Bezerra and Lindbergh Farias followed suit, asking that on their official legislative names be added the former president’s name. “It’s the ‘I’m Lula’ campaign,” said Farias when asked why he was requesting the change. “Lula asked us all to speak for him, to be a little bit of him,” added the lawmaker. In the Lower House, PT Chamber leader, Paulo Pimenta also asked Chamber president, Rodrigo Maia to officially change his name to Paulo Lula Pimenta. Following the steps of federal lawmakers, state legislatures have also began to receive the same requests. In the São Paulo City municipal assembly, at least four lawmakers have officially made the request to add the name ‘Lula’ to their identities. “The longer they leave me there (prison), the more Lulas will be born in this country and more people will want to fight in this country,” predicted former president Lula during speech. And the trend seems to be spreading to the entire spectrum of Brazilian politics. Lawmakers from right and center-wing parties have also started to request that names like (presidential candidate) Bolsonaro and (Lava-Jato judge) Moro be added to their official legislative names.